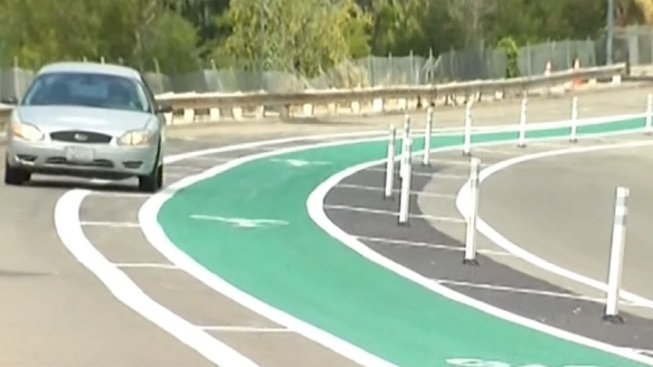 San Diego Mayor Bob Filner unveiled a new bike-way on Tuesday to improve bicycle safety along busy roads. The bright green bike lane was added to Montezuma Road, beginning at the intersection of Collwood Boulevard. It’s an area known to have heavy traffic coming off the nearby freeway. In 2012, a cyclist died on Montezuma Road after he was struck by an SUV. Other new lanes in the area will be painted green and placed on specific roads known to cause serious accidents between cars and bicyclists. There are also 2 or 3-foot buffers on either side of the lane, which are marked with white lines and flexible markers. Other bike lanes added will also be painted green but may not have the flexible markers. Future lanes are planned for Nimitz Boulevard and Harbor Drive. A cyclist who's been commuting through the area on his bike for the past seven years talked about being squeezed off the road by cars - even having to push on their windows to let them know he was there. Mayor Bob Filner told a crowd of cyclists that he is committed to improving bicycle safety across the entire network of city roadways, and is working with stakeholders to develop solutions for "conflict zones" where cars and bicycles need to share road space.